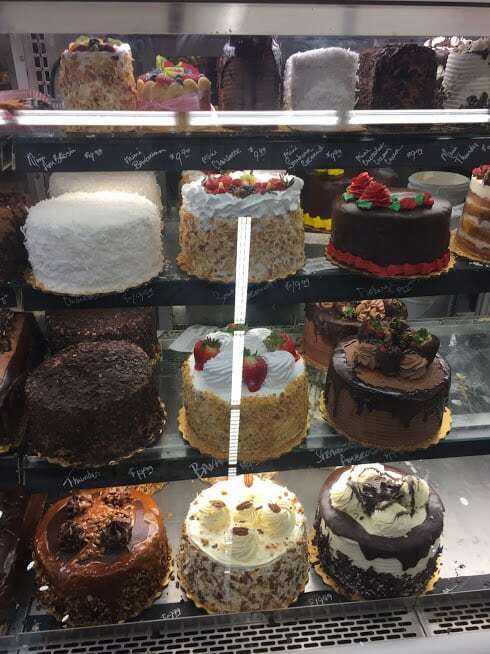 If you ever pass by a Rouse’s Supermarket, do yourself a favor and stop in for their Gentilly cake or cupcakes. A real treat! Here is a glary picture of some of their lovely creations. I dropped in for a visit to the Lafayette store last time I was home because I just had to see what all the fuss was about. The fuss about those delicious cakes and cupcakes. A small section of Rouse’s bakery showcase. Accentuating the small here! Which one would you like? Wished I had a better shot. There were several ladies behind this counter busy as bees. I hurriedly took a picture before I drew too much of their attention. After one of them asked nicely if they could help me I said, “Oh, no, thank you,” and speedily drove my buggy away. (Stalker!) Anyway, aren’t they beautiful? Just beautiful!!! After strolling about the patisseries some more I quickly gave in to the temptation of the Gentilly cupcakes that my sister raved about. It was their beauty that lured me to them and sure enough, they tasted as good as they looked. Wished I had taken a photo before they were all gone, but here’s their website www.rouses.com that shows their Gentilly cake. The cupcakes are just a mini version of them. This Gateau (meaning, cake) Frais (meaning, fresh) was inspired by that Gentilly cake. They are a little lighter and have the flavor of vanilla instead of almond like Rouses’ has. I recently baked it for a treasured friend who was visiting us on her birthday. She is very familiar with Rouses’ Gentilly cake, but is not a fan of the almond taste so that worked out very well! In fact her husband gave this cake it’s name. Hint: using a large, sharp knife makes a prettier cut. It still tastes good, though! Now, I live too far away from Rouses’ to stop by and pick up some cupcakes every time I want one. So this is my attempt to satisfy that Gentilly craving. Before baking, I decided those cute little tulip cupcake holders would be great to help keep the fresh fruit on top. You know the ones like Joanna Gaines uses in her bakery at Magnolia Market Silos? Yeah, those are the ones. Not being able to find any nearby, I came across some clever gals on Pinterest who made their own so I gave it a try. It didn’t quite turn out like I wanted, but it’s a start. I should have pressed the paper folds firmly against the sides of the pan before adding the batter. It’ll be better next time. You should give them a try and let me know how they turn out. Not hard at all! The recipe for these little lovelies’ batter is very easy. You can use a cake mix of your choice, but I urge you to make your own from scratch. It tastes better and is much more rewarding than baking from a box plus you know exactly what’s in them. After the cupcakes baked I cut a hole out of the center using a large pastry tip. I wanted to get as much icing in and on there as I could. I think Rouses does the same. The frosting is made of cream and mascarpone cheese with some powdered sugar and a bit of vanilla bean paste. You can find this paste in the cake decorating section of stores or use regular vanilla extract. I stuffed them with frosting by using a pastry bag and tip, but you can use a butter knife or spatula. Any kind of fresh fruit you want can be added on top. It finishes off it’s appearance and adds that fresh taste. These babies need to be refrigerated until serving time. They can be frozen without the fruit for a later date. Inspired by the Gentilly cake from Rouses Supermarket these light and moist, vanilla cupcakes are stuffed and frosted with a Mascarpone cheese frosting and topped with fresh fruit. Beautiful and delicious! Any of your choice. Berries work well. Prepare 2 – 9″cake pans or 24 cupcakes for batter. Cream together butter, shortening and sugar in a large bowl for 3 minutes. Sift together flour, baking powder and salt in a separate bowl. Add dry ingredients and milk alternately into creamed mixture mixing until well blended. Stir in vanilla. In a separate bowl beat egg whites until stiff peaks form. Fold into cake batter. Pour batter into desired cake pans or cupcake holders. Bake at 350 degrees for 20-25 minutes for cake or 15-20 minutes for cupcakes. Remove from oven as soon as batter is set and an inserted toothpick comes out clean. You don’t want to over bake this cake. Frost cake layers and top with fruit before adding next layer. Frost outside of layered cake and top with whole, fresh fruit to garnish. For cupcakes, make a hole with a decorating tip in the center and pipe cupcake with Mascarpone Frosting from the inside out. Pile the frosting high and top with fresh fruit of your choice. Mix together in a large bowl Mascarpone cheese, powdered sugar and vanilla together. In a separate bowl beat whipping cream until stiff peaks form. Fold cream into Mascarpone mixture until well incorporated. Frost cake or cupcakes. You can be as creative with this cake or cupcakes as you want. It’s not only delicious, but appetizing to the eye. Thanks! They just may be a safer portion.